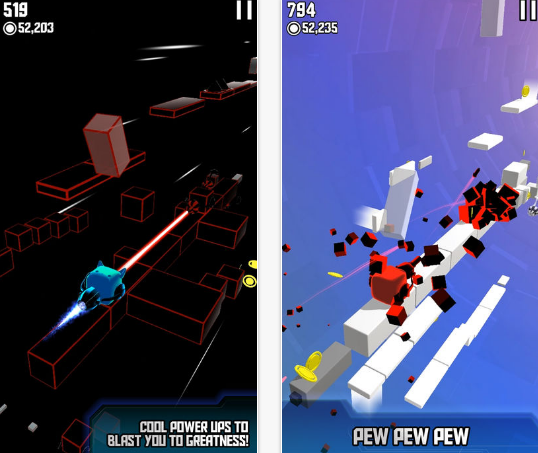 Endless runner games have become quite popular in recent years. For those who don’t know, endless runner games don’t end. You continuously “run” through the game until an obstacle stops you with the point being to achieve the highest possible score. Their quick play, addicting nature, and simple controls make them an accessible genre that virtually anyone can pick up and play. Everyone knows about the big infinite runner hits like Temple Run, so let’s take a look at another awesome endless game for iPhone and iPad. We’re actually talking about an endless arcade hopper developed on the iOS platform, called Q-Bit Revolution. Created by 111 Games, this awesome and one of a kind game allows players to rotate the playing field to avoid obstacles, find hidden items, and collect coins. So get ready to be engaged in a never-ending, fast-paced gameplay with 3D graphics and cool soundtrack from Abandon Building Records' own Set in Sand. In Q-Bit Revolution you control your cube with easy tap and swipe controls. Just hop and flip the 3D world around, past a wide range of obstacles and dodge lasers, spikes, and moving blocks. Play through 150 custom-built randomly loaded levels, customize the color of your starter cube and unlock new rare cubes to play with. Navigate challenging paths to collect medallions and trophies, collect coins, make unbeatable scores and compete against other players from all over the world. Complete as many in-game quests as you can and try to win the legendary Crown Cube! Additionally, you can use cool power-ups to help you on the adventure: Rocket, Boost and Magnet, Plus- double jump stars, and slo-mo blocks. Join the revolution by downloading Q-Bit Revolution for free – it is available on the App Store.